The only thing better than a donut is a free donut -- which is why we're letting you know all the places in LA you can get a free donut for National Donut Day on June 3rd (also be sure to check out the full list of this year's deals for National Donut Day). The SaMo shop (and the original Costa Mesa location) is giving free donuts away to the first 100 customers. Well, they're not quite free but they may as well be: the beloved cafe's original location is doing donut holes for $1 a bag. 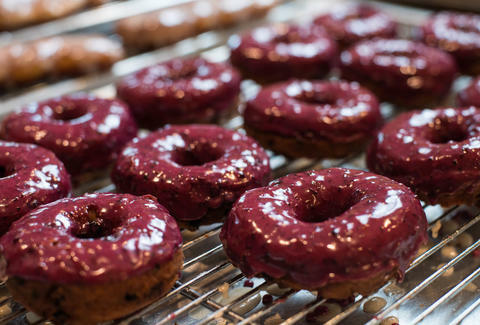 This new vegan donut spot's got free coffee for the first 30 peeps who buy donuts -- so, better get over there early! 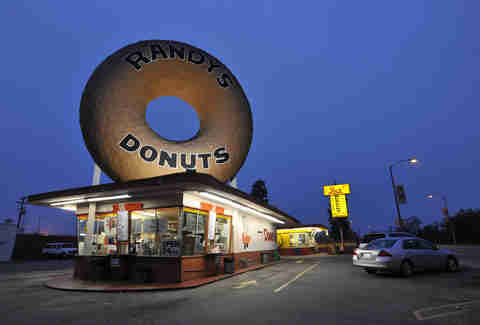 The spot off the 405 with the iconic giant donut sign's doing free donut holes from 6am-12pm. This just-opened spot's got an Instagram contest for one winner to get a free 24K gold donut (worth $100 -- seriously), and is giving a coupon for a free donut at any time to everyone who orders a treat today. This old-school favorite's partnered with Grubhub for delivery of two half-dozen orders of donuts for the price of one. Office party!!! Jeff Miller is the editor of Thrillist LA and is definitely throwing an office party. He works alone. Join him at @jeffmillerla on Instagram.